A bespoke, architect designed contemporary family home on the outskirts of Sheffield. The illustrated design shows a split level scheme, which successfully works with the sites steep topography. To create more privacy for our client and to minimise the buildings impact on the surrounding area, we partly lowered the structure into the site. The entrance, kitchen, living room and study / guest bedroom are all on the higher ground level. On the lower ground floor, we designed a spacious arrangement for the three bedrooms and family bathroom. The two main bedrooms have access onto the secluded veranda. At Spacestudio we work closely with our specialist landscape architect / consultant . 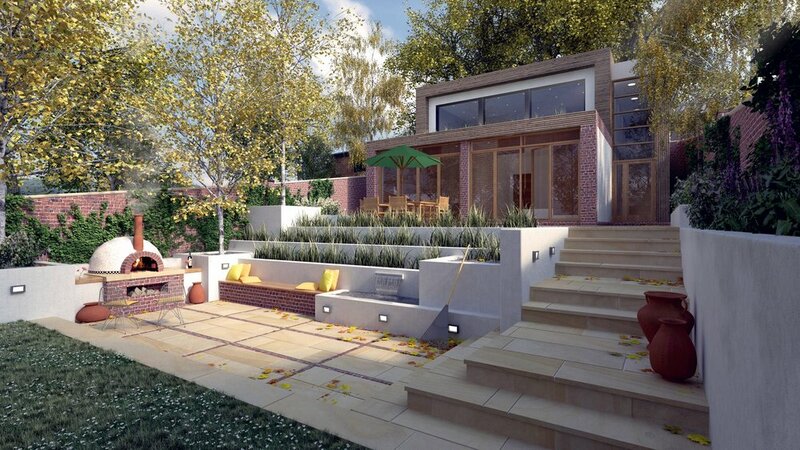 The advantage to our clients, our garden designs integrate harmoniously with the architecture. Feasibility study, architectural, landscape and interior design and planning submission. Amer Ahmed is an ARB Registered Architect and a RIBA Chartered Member. Spacestudio has full Public Liability Insurance.